Another world is possible! How do we create it, grow it, preserve it, share it? How do we come into relation with ourselves and the land, nourishing our bodies, minds and spirits with the food and wisdom we create together? These are the questions (and answers!) explored by TLC Farm's Community Sustainability Immersion Program - a dynamic experience of community learning and sharing. Located at TLC Farm's unique seven-acre community farm in Portland, Oregon, this program immerses participants in a wholistic approach to sustainability and permaculture systems. 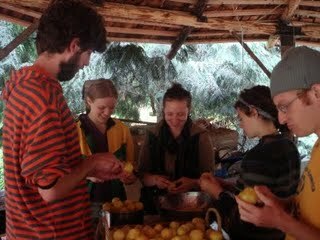 The program combines theory, practice, innovation and adventure to introduce participants to the principles of permaculture, natural building, community process and organic gardening, with a focus on local food and plant medicine. Interns will tend, harvest and preserve food from the animals and garden, learn to make medicine from wild and cultivated plants, visit urban & rural sustainable farms, and much more! Tuition, room & board: $1,600. ($1,500 if signed up by June 15). Courses will be taught by TLC Farm teachers and local experts. Each program participant will come away from this program with a set of skills which will be increasingly useful in our changing climate and economy and will a personalized action plan, supported by community mentors. A limited number of work-trade scholarships are available. Please contact intern@tryonfarm.org or call 503-245-3847 for more information about the program and registration. Application instructions are available at http://tryonfarm.org/share/node/687. 1. Community living: Program participants will experience communal life on two levels. You will create a community and be responsible for collective decision-making, meal preparation, conflict resolution, etc. In addition, the community of interns will interact with, and be supported by, Cedar Moon, the intentional community at TLC Farm. 2. Outdoor living: The program is an immersive, outdoor experience. You will live in tents, wash in outdoor showers, cook in a outdoor kitchen, and have most classes and work experience outdoors. There will be an indoor space for reading, research and chill time with computers and a library. While Portland has a well deserved reputation for rain, summers are often quite dry especially from July through September. 3. Hands-on work and Theory: The program includes a balance of lectures & discussions with hands-on experiential learning and field trips. Over time, the hands-on work will become increasingly self-directed. 4. Food preparation and sharing: You will be provided with ingredients and suggestions as needed, and will collaboratively create and implement a cooking and cleaning schedule. TLC Farm is primarily a vegetarian community: we have chickens and dairy goats for eggs and milk and grow much of our own food. 5. TLC Farm location & history : A unique seven-acre farm surrounded by a 700-acre state park in Portland, Oregon, TLC Farm demonstrates how sustainable living techniques can further goals often perceived as contradictory: urban density of human habitat inside the growth boundary, combined with not only conservation of natural resources and public greenspace, but actual enhancement of native ecosystems. TLC Farm was born out of a community effort to save the land from development and turn it into a community space for sustainability education. This land now functions as a gathering place, sustainability education facility, community center and retreat – all within a bike ride from downtown Portland. 6. Work Study positions: There are four work-study positions provided for the program. Food coordinators will help the create menus for each week based on food available at the farm, coordinate cooking and cleaning schedules, and manage the community kitchen. Scribes will take notes and photographs of all aspects of the program and use these to create a blog during the program. Work trade positions will require approximately 10 hours of work per week.